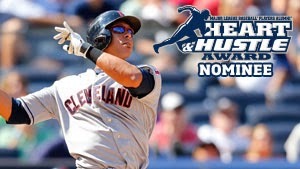 All Things Brantley, All Things Tribe: Vote Brantley For MLBPAA's 2014 Heart & Hustle Award! Vote Brantley For MLBPAA's 2014 Heart & Hustle Award! back on July 22, i wrote a blog about how Michael Brantley was the Cleveland Indians' recipient of MLBPAA's 2014 Heart & Hustle Award. to recap, the Heart & Hustle Award is given annually to active players who demonstrate a passion for baseball and best embody the values, spirit, and traditions of the game. this honor was created by the Major League Baseball Players Alumni Association and is awarded to 30 preliminary winners, one player on every team. it is the only award in baseball that is voted on by former players. the MLBPAA has 30 committees made up of alumni players with established relationships to each major league team. these committees choose one player from each team based on his passion, desire, and work ethic both on and off the field. then at the end of the season, fans, alumni, and active players can vote for the final winner of the award from the 30 individual team recipients. tonight, i was made aware that fans can finally vote. i'm not sure, however, if voting has been open prior to today, and if it has, i'm very sorry that i couldn't alert my readers to it sooner. my Tribe sources should have been a little more on top of this, for the love of Brantley lol anyways, fans can now vote until November 8 at 11:59 pm EST. the fan vote counts for 5% of the total vote, so in all honesty it's probably not going to make much difference. regardless, you can still VOTE FOR MICHAEL HERE. the final winner will be presented with his Heart & Hustle award on November 18 at the 15th annual Legends for Youth dinner in NYC. good luck, Michael!